The Ibrox side travel to the north east of Scotland to face Brechin City in the opening round of the Ramsdens Cup. Rangers will look to put the drama of recent months behind them as they aim for a winning start to their Ramsdens Cup campaign at Brechin City. The Ibrox side will play their first competitive match at Glebe Park in front an expectant away support, just days after being granted a conditional Scottish Football Association (SFA) licence. Thousands of fans are expected to travel to Angus in the north east of Scotland with more than 4000 tickets selling out far in advance of kick off. Following the liquidation of the old Glasgow Rangers, a host of star players including captain Steven Davis refused to have their contracts transferred, leaving manager Ally McCoist with a threadbare squad to rebuild the club in division three. However, experienced forward Lee McCulloch, goalkeeper Neil Alexander and Scotland left-back Lee Wallace are expected to feature in the cup tie, with all three electing to have their contracts transferred. Fans may also see new signings Ian Black and Andy Little, who signed three-year contracts with Rangers on Saturday. Should the feature, the duo will take part in the game as trialists as they will not be formally registered with the club until next week. Both players had been out of contract this summer having been at Hearts and Rangers, respectively, last season. Their signings were made possible due to a temporary reprieve of a the Gers' 12-month transfer embargo, allowing them to sign players until the end of August. Ahead of the tie, Lee McCulloch, told Rangers website that the side are not expecting an easy game. He said: "Brechin will be hard to beat. We saw in the St Johnstone games they made it really difficult for them. Everybody will look at the tie and some will say it'll be a walkover for us but we're not going in with that attitude anyway. "If we play the way we can, we'll be confident of getting a result but that's all we'll be and we need to work for a win.It's not as simple as just turning up and winning. Teams will make it difficult for us this season and they might sit in until we break them down. "Any time we've played against teams from the lower leagues it has been in cup matches and they've not been easy.As such, we're not going into the season with the attitude we're going to win 3-0 or 4-0 in every game like some people are saying. "The teams in the SFL are going to be very well organised and they'll make it as difficult as possible for us." SFL league matches will start on August 11 but the Ramsdens Cup competition marks the start of the season for first to third division clubs. Brechin are seen as the underdogs for the match, despite now playing in the division above Rangers, and local pubs and businesses say they are hoping to cash in on the historic match and the arrival of thousands of fans. Souvenirs such as commemorative mugs are being sold to mark the occasion. Chairman of the Brechin and District Business Association Bill Sturrock told the Sunday Herald: "Many shops will be shut today as it's a Sunday but there will obviously be benefits for the hotels and food retail outlets that are open, as well as the pubs. "Some of the pubs are doing ticket-only events to restrict numbers and comply with their licensing requirements." 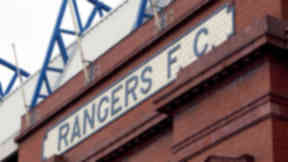 The match remained in doubt until Friday when Rangers were granted conditional membership of the SFA following weeks of discussions. A joint statement read: "We are pleased to confirm that agreement has been reached on all outstanding points relating to the transfer of the Scottish FA membership between Rangers FC (In Administration), and Sevco Scotland Ltd, who will be the new owners of The Rangers Football Club. "A conditional membership will be issued to Sevco Scotland Ltd today, allowing Sunday's Ramsdens Cup tie against Brechin City to go ahead. "Following the completion of all legal documentation, the Scottish Premier League will conduct the formal transfer of the league share between RFC (IA) and Dundee FC on no later than Friday 3rd August 2012. "At this point, the transfer of Scottish FA membership will be complete."